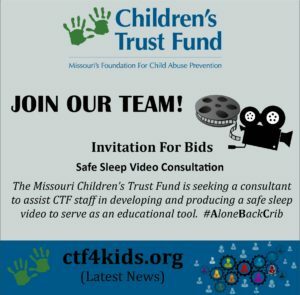 The Missouri Children’s Trust Fund (CTF) is seeking a consultant to assist CTF staff in developing and producing a Safe Sleep video to serve as an educational tool to promote safe sleep practices and prevent infant death. The video will be utilized by Missouri birthing hospitals, child serving agencies and the general public. The Children’s Trust Fund (CTF) is Missouri’s foundation for child abuse prevention. CTF was created by the Missouri General Assembly in 1983 as a 501c(3) non-profit organization with the sole purpose to prevent the abuse and neglect of children. Located within the Missouri Office of Administration, CTF is governed by a twenty-one member Board of Directors. Develop a Safe Sleep education video that leverages detailed analysis of infant death, first-person interviews and consumer insights. Convene and provide expert guidance to a Safe Sleep Planning Committee of stakeholders to identify common strategies, objectives, needs and aspirations for the Safe Sleep video. Research and review sleep related infant deaths in Missouri to inform the video content and to better understand existing barriers, trends, gaps in education, and prevention methods. Develop presentations about learned information for the stakeholders and creative/production teams. Develop and facilitate in-person interviews with a diverse pool of families for inclusion within the video. Facilitate focus groups/design sprint with stakeholders and families; information gained shall inform the project and guide the messaging strategies, script, creative, etc. Develop final recommendations and creative brief for production team/audiovisual consultant. Partner with the selected production company to ensure creative brief is followed for script and shot list development. Please identify the primary individual who will work on this project. What are the applicant’s individual and/or agency experience and knowledge related to infant mortality, collective impact and safe sleep initiatives? What is the applicant’s individual and/or agency experience in developing/producing safe sleep videos, campaigns, messaging, scripts, etc.? What is the total, all-inclusive proposed budget amount to conduct the tasks outlined in the Scope of Work (assuming a contract period of October 2018-March 2019)? Completed proposals shall be emailed to Paula Cunningham at paula.cunningham@oa.mo.gov by 5 p.m. Wednesday, October 17, 2018. Selection shall be based on the best and lowest bid. Further inquiries may be made to Paula by email or by calling 573-751-2266/5147. Thank you.